Juri Commons is a tree-lined mini-park that cuts through a city block bound by Guerrero St., San Jose Ave., 25th St. and 26th St., and feels like a hideaway in the city. Parents frequent this spot with their kids where they can enjoy the wonderful play structure that has a rubber ground in case a child takes a spill. 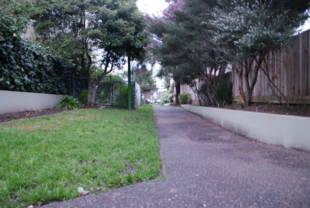 Dog owners also enjoy coming here and taking their dogs for walks. 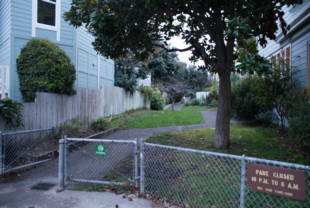 This green space is in great condition and is well cared for by volunteer neighbors. 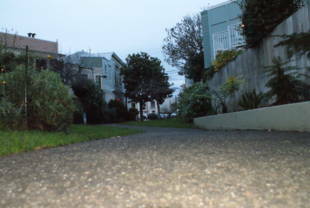 Juri Commons is owned by the San Francisco Recreation and Park Department. Muni access: #12-Folsom -- Valencia and 25th Street stop; walk one block west on Valencia to San Jose Ave., then south to Juri Commons. #27-Bryant, #36-Teresita, #67 Bernal Heights -- Valencia and Cesar Chavez Streets; walk one block north to 26th St., one block west to San Jose Ave., then 2/3 of a block north to the park's entrance. #14-Mission, #49-Van Ness/Mission -- Mission and 26th Street; walk six very short blocks west to San Jose Avenue, then 2/3 of a block north to the park's entrance. 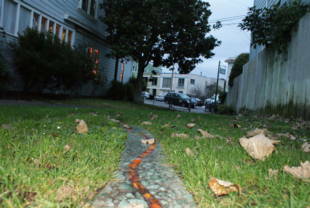 Established: 1974 Juri Commons was originally a stretch of railroad track of the SF & SJ Railroad. From 1864-1906, the San Francisco and San Jose Railroad was one of California's first inter-city rail links. A $2.50 ticket for a trip between the two cities brought passengers through the Mission District. When San Francisco magnates Mark Hopkins, Huntington Hartford, Charles Crocker and Leland Stanford bought out the SF & SJ, it marked the beginning of the Southern Pacific Railroad. After the 1906 earthquake, new tracks were built along the Bayshore replacing the Mission route and its tracks were pulled up and hauled away. Fast forward to the 1970's when the Mission Planning Council, the Mission Housing Development Corporation (MHDC) and the Open Space Committee were working together to identify possible sites for neighborhood parks. 'It was a long gestation period,' says Toby Levine, unofficial neighborhood historian who lives across the street from Juri Commons. 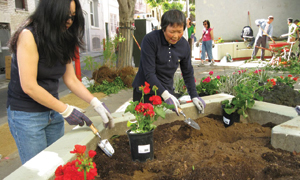 The MHDC in its 1974 report noted, 'a park would serve that section of the Mission which has no park at all.' Securing funding for open space acquisition was a challenge, however, even with the support of Cesar Chavez who led a march to promote the open space ballot measure with the banner 'SI on C.' Despite the nifty slogan, it failed. Two years later its replacement, Proposition J, passed and the old train yard became a park. Juri Commons, 120' long and 25' wide, opened early in 1986 as a pleasant green mini park containing a few benches and a compact children's playground. Renovations in the 1990's saw the installation of the irrigation system, replacement of playground sand with resilient poured-in-place surfacing, and a bulletin board. Today a visitor finds flowering trees hanging over a redwood fence, bright flowers, fresh green grass and a stunning mural: Tirso Gonzales's vibrantly colored, sardonic view of dot com boom and bust in the Mission - it marks an era embedded in the city's history. Juri Commoners have become ardent stewards of their park. Monthly work days have transformed the park. A ' Walk in The Park' program asks 30 Commoners to commit one day a month to perform cleanup/safety patrol work. The SF 311 website is used to report damage and/or vandalism. 'As stewards of the park, neighbors volunteer in the maintenance programs and get acquainted, working together in the only yard most of us in the neighborhood will ever know,' says Laura Glatstein, a Core Commoner, adding, 'we're looking forward in new directions.' Its ' Live Art' block party in October served as a park pi ata --spilling out live musicians playing, children drawing on the pavement with chalk, and sculptors carving pumpkins. The Juri Commons train is moving full speed ahead.